In honor of National Crime Victims week I submit this blog on one example of many important ways Survivors feel remembered, honored and empowered. This was sent by Dayna Herroz, mother of daughter and 10 month old grandson who was murdered by the biological father in 2006. I wanted to share this photo with you. 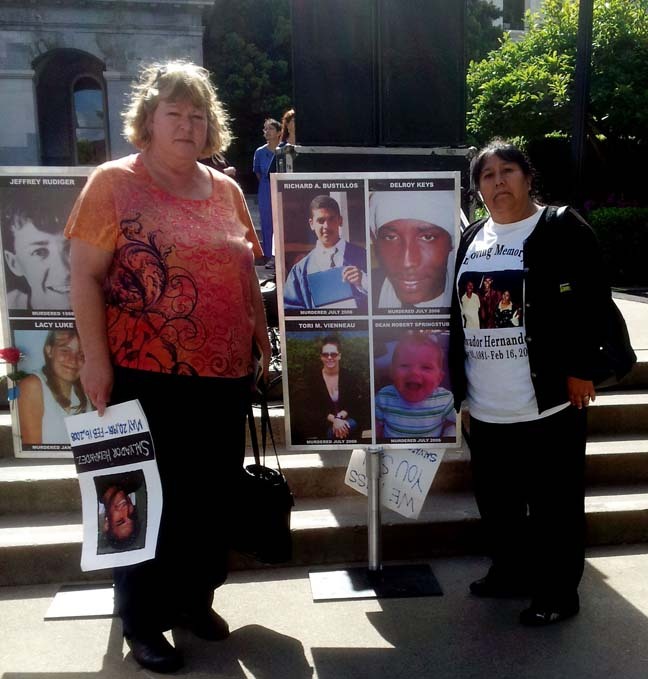 Tracy & Cathy are mothers who I work with through violent loss. They went to the capitol in Sacramento where families of murder victims are present and making a difference in trying to pass stricter laws, debate the issues before us, and trying to change the fact that criminals have 23 rights written in the constitution, and victims have ZERO. Obviously the scales of justice are not balanced and this must change. What better time to do this than this week (National Crime Victims Rights Week).?? I had Tori and Deans photos presented there 5 years ago but was unaware that they are still presented every year, that is until these moms took a picture of themselves in front of Tori and Deans photo. I am so touched and honored that they took the photo for me. This is one of those instances where it is proof positive that I often get more from these families than I can possibly give back; although some may disagree with that; I know it to be true. All I know is I am truly blessed to have people in my life that know what would lift up my heart and that photo sure does.